Exile’s ‘Kiss You All Over’ ticked over to 4 weeks at 1 while La Bionda’s ‘One For You, One For Me’ was stuck at 2 for a second week. The Italians had only seen 1 chart topper so far in the form of Giorgio Moroder’s ‘Looky Looky’. ‘One For You, One For Me’ was only the second of 6 songs by Italians to chart so far to make the top 2. Crystal Gayle took the climber of the week award with a 5 place climb from 18 to 13 by her hit, ‘Hello I Love You’. This was the only star rater this week. 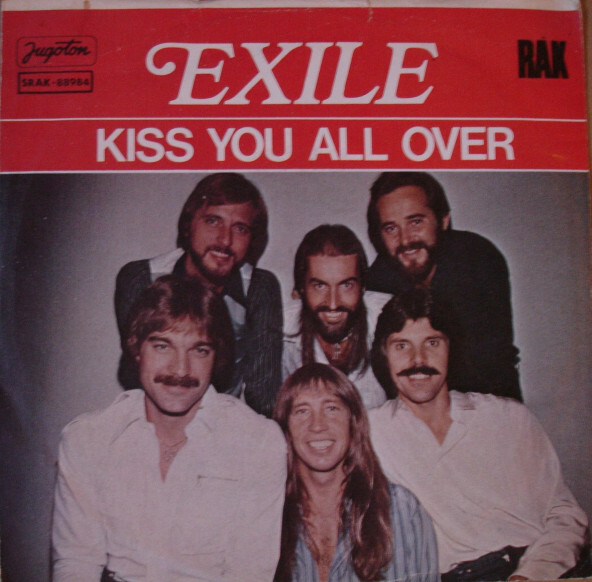 On the falling front it was Pacific Express’ ‘Give A Little Love’ and Andy Gibb’s ‘Shadow Dancing’ that shared the honours with both songs dropping 5 places to land at 16 and 17 respectively. The oldest song on last week’s ‘chart, Gerry Rafferty’s ‘Baker Street’ was the first of 3 songs to depart the chart. It had a run of 21 weeks and spent 8 of those at number 1. The song that had knocked ‘Baker Street’ off the top spot, Marshall Hain’s ‘Dancing In The City’, took over as the oldest in the charts. It had been with us for 19 weeks. The 21 week run that we had seen with a song from the film ‘Grease’ in our charts came to and end this week as John Travolta & Olivia Newton-John’s ‘Summer Nights’ dropped out of the top 20. It had managed a run of 7 weeks and peaked at 9. This and ‘You’re The One That I Want’ would be Travolta’s only SA chart hits, giving him a total of 25 weeks in the chart and a beast peak of 2. In total the 3 Grease songs (the 3rd being Frankie Valli’s ‘Grease’) would clock up 31 weeks with ‘You’re The One That I Want’ peaking highest. The final song to go was Lesley Hamilton’s ‘No Hollywood Movie’. It managed a run of 16 weeks and peaked at 2. This would be her only SA chart hit. The first of the new entries gave us the 5th song title that had also been the name of an act that had charted. Foreigner’s ‘Double Vision’ entered the charts at 12 this week and its title shared a name with New Zealand band Double Vision who had had a hit in 1973 with ‘Maori Love Song’. The inspiration for the song’s title apparently came from an ice hockey game where a player was knocked down and had to be substituted because he was experiencing double vision. Lead singer for Foreigner at the time, Lou Gramm, co-wrote the song with band mate Mick Jones and it would give them a number 2 hit in the US (kept off the top spot by Donna Summer’s ‘MacArthur Park’) and would go to 7 in Canada and 97 in Australia. Gerry Rafferty gave us the 20th occasion when an artist would replace themselves on the charts as his ‘Right Down the Line’ entered the top 20 in the same week that his ‘Baker Street’ exited. Cliff Richard was the only act who appeared twice amongst those 20. The follow up to ‘Baker Street’ got to number 12 in the US charts where ‘Baker Street’ had managed to get to 2. However in his native Britain, the it would not chart. It would make it to 5 in Canada, 33 in New Zealand and 93 in Australia. ‘Right Down The Line’ was recorded at Chipping Norton Recording Studios in Chipping Norton. The studio was the recording place of a few UK number 1 singles in the 80s namely Kajagoogoo’s ‘Too Shy’, Jim Diamond’s ‘I Should Have Known Better’ and Fairground Attraction’s ‘Perfect’. John Paul Young returned to the chart with his 6th hit to date, ‘The Day That My Heart Caught Fire’. He now had the tied 3rd highest hit count for an act from the non-big 3 nations, equalling Ireland’s Joe Dolan and being 1 behind fellow countrymen The Seekers and 6 behind Sweden’s Abba. Once again the song writers for his hits were George Young and Harry Vanda. It was the 8th hit for this song writing duo who had written all 6 of John Paul Young’s as well as John Edmond’s ‘Pasadena’ (which was a cover of John Paul Young’s version) and 5000 Volts’ ‘Can’t Stop Myself From Loving You’. ‘The Day That My Heart Caught Fire’ would make it to 20 in Australia but wouldn’t worry the charts elsewhere in the world apart from South Africa. It was the 20th song by an Aussie act to chart and Australia now sat tied 6 with Germany for overall hits by acts from a nation. The number of hits by groups was back up to 10 after a run of 11 weeks where it had been less than half the chart. Tommy Dell made 14th place on the local weeks count list his own as his 51 pulled him 1 clear of The Dealians who dropped into 15th place.